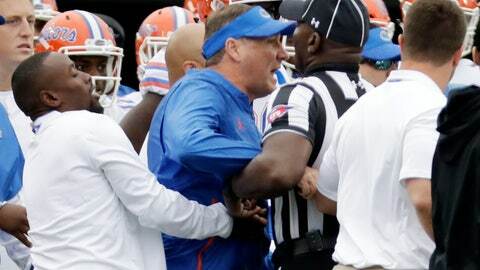 In the end, the Gators’ big comeback overshadowed the near brawl in which both head coaches yelled at each other. Jordan Scarlett ran 48 yards for the go-ahead touchdown on the first play of the fourth quarter, and No. 14 Florida rallied from an 18-point deficit to beat Vanderbilt 37-27 on Saturday to match the largest road comeback in school history. The Gators (6-1, 4-1 Southeastern Conference) snapped a 26-game skid when trailing by 18 or more points. They scored 24 straight after Vanderbilt jumped out to a 21-3 lead midway through the second quarter, their first comeback win since Sept. 27, 2003, at Kentucky. The finish was nearly overshadowed by an incident in the second quarter on a Florida punt return with SEC Commissioner Greg Sankey on hand to watch. An official held back Mullen as he yelled at Mason , who was near the Gators’ sideline after checking on the Commodore defender whose helmet was knocked off by a hit by linebacker James Houston IV. Both teams spilled onto the field, drawing unsportsmanlike conduct penalties. The penalty cost the Gators their leading tackler; Vosean Joseph was ejected for his second unsportsmanlike conduct penalty of the first half. Two people escorted an emotional Joseph off the field. Mullen and Mason hugged each other at midfield after the game. Mason said they talked. The Vanderbilt coach heard a Florida player say something to him and said he responded, then Mullen got mad. Florida won its fifth straight this season. The Gators also beat Vanderbilt (3-4, 0-3) for the fifth straight year and 27th time in 28 games in this series. Vanderbilt turned three turnovers into 17 points, and the Commodores also sacked Feleipe Franks twice and stripped him of the ball once. They also intercepted Franks once. Kyle Shurmur threw two touchdowns with his father, New York Giants coach Pat Shurmur, in the stands. Jamauri Wakefield also ran for a TD. When Florida could hold onto the ball, the Gators simply dominated and outgained Vanderbilt 576-336 in total offense. Scarlett finished with 113 yards rushing, and Lamical Perine added a TD run and 121 yards rushing for the Gators’ first 100-yard rusher this season times two. Franks threw for a career-high 284 yards and two touchdowns. His second, an 11-yarder to Freddie Swain, padded the lead midway through the fourth quarter to seal the comeback. Florida: The Gators struggled yet again with too many penalties. The costliest came when they left the sideline while Vanderbilt trainers tended to lineman Dare Odeyingbo and coaches started yelling at each other. That unsportsmanlike conduct penalty wound up being the second for Joseph. The linebacker had been flagged for unsportsmanlike conduct on Vanderbilt’s third TD drive for slamming a running back to the ground after the whistle. Vanderbilt: The Commodores start 0-3 in league play for a sixth straight season. It didn’t help that they lost running back Ke’Shawn Vaughn early in the second quarter to an unspecified injury. Vaughn finished with one catch for 75 yards and a TD , and he ran seven times for 56 yards before being hurt. The Gators played sloppily enough with seven penalties for 89 yards along with the turnovers that holding their ranking will be good after their escape in Nashville. Florida: The Gators have an open date before their annual game with No. 2 Georgia on Oct. 27. Vanderbilt: The Commodores visit No. 18 Kentucky.